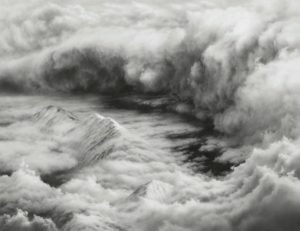 Sunday, October 13, 2019 – 3 to 4:30 p.m.
Hilary Brace creates other-worldly meteorological landscapes that envelop the viewer. The ethereal, expertly drafted work conjures all the senses. One might, at first, perceive them as photographs, when, in fact, they are charcoal on Mylar (polyester film) drawings. After studying at Western Washington State University, Hilary earned her Master of Fine Arts from UCSB. Brace is the recipient of numerous national and regional awards, including a Guggenheim Fellowship (2006), National Endowment for the Arts Fellowship (1993), California Arts Fellowship, and two grants from the Pollock-Krasner Foundation. Join us for AfterGLOW, a celebratory supper hosted by Veronique’s Oaken Grove & Luther Tolo immediately following the program. Paid reservations are essential & required prior to October 8. We expect this AfterGLOW to sell out.